Mar 2019 – Welcome to new lab members Annelot Staes from Utrecht University, Netherlands and Thomas Itruarte! Feb 2019 – Our Cell metabolism preview (here) of Poillet-Perez et al. (2018) is out! Sept 2018 – Christina is awarded an NIH Ruth L Kirschstein National Research Service Award predoctoral fellowship! well done CA! July 2018 – Welcome to the Perera lab Julian Yano, Zeynep Cakir and Denna Kwang ! May 2018 – Welcome to Mauricio Flores (UC Riverside) who will conduct summer research in the Perera lab through the UCSF SRTP program. December 2017 – Perera-Zoncu lab Christmas Party! November 2017 – Suprit Gupta joins the Perera Lab - Welcome Suprit! October 2017 – Anthony Venida wins best poster prize at the annual BMS retreat in Lake Tahoe !! yeeeeessss Anthony! August 2017 – After a busy summer, SRTP student Megan Montoya presents her data from her time in the Perera Lab at the poster day. July 2017 – BMS graduate student Anthony Venida joins the Perera Lab! Welcome Anthony. June 18-24th 2017 – Christina presents a short talk at the Gordon Research Conference on Pancreatic Disease, Waterville Valley, New Hampshire. Congrats Christina! May 2017 – Welcome to undergraduate students Justine Rutter (Duke University) and Megan Montoya (University of Arizona) who will conduct summer research projects in the Perera lab. April 10th 2017 – Chris Waters - Tetrad grad program - starts his rotation! Welcome Chris! March 2017 – Congratulations to Andrea and Anthony - recipients of NSF graduate research fellowships! Congrats to Austin for an honorable mention! Well done team!! Jan 2017 – Austin Hsu and Anthony Venida start their rotations in the Perera lab - Welcome!! JAN 2017 - HAPPY NEW YEAR!! Dec 15th 2016 – End of rotation lab lunch for Jeremy and farewell to Kelly Devereaux - Pathology resident and visiting scholar from Stanford University. Nov 17th 2016 – World Pancreatic Cancer awareness day. GO PURPLE!! Oct 4th 2016 – Rushika is awarded the NIH Director's New Innovator Award !! Sept 30th 2016 – Lab Beer-Burgers-Bowling night! Highest score goes to .... Jeremy! April 2016 - We are in New Orleans for the American Association for Cancer Research (AACR) annual meeting! Rushika is awarded the AACR-Pancreatic Cancer Action Network Career Development award. Click here for Career Development Awardees. April 2016 – Andrea Eastes - BMS grad program - starts her rotation! Feb 2016 - Christina Adams - BMS graduate student and NSF predoctoral fellow joins the Perera Lab !!!! Jan 2016 - HAPPY NEW YEAR! September-October 2015 - the first packages arrive! 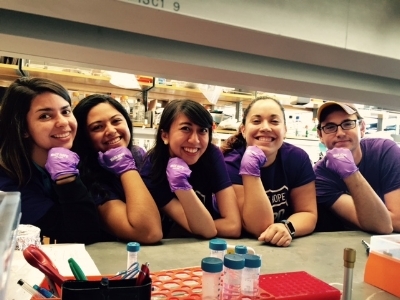 September 1st 2015 - PERERA LAB GRAND OPENING!! July 2015 - Boston University, School of Medicine Cancer Center welcomes Rushika to present her work on autophagy regulation in pancreatic cancer at the Hematology/Oncology Grand Rounds Seminar Series. October 2015 - The LA Cancer Challenge - the annual 5K/10K walk/run fundraiser for pancreatic cancer research begins! Rushika speaks about the lab's research along with other recipients of Hirshberg Foundation Seed Grants. (Agi Hirshberg pictured in angel costume). First delivery of lab equipment!